Q. What is the iPCRN? The ICGP, the HRB Primary Care Research Centre (in RCSI) and WestRen (NUIG) are currently collaborating to establish an Irish Primary Care Research Network (IPCRN). Q. What is the overall aim of the iPCRN? Q. Why should i join the iPCRN? Provide General Practice with new applications/tools to audit and manager their patient care. Q. How do I join the iPCRN? iPCRN tools will become available to you as standard through your approved practice software provider. If your service provider has not been approved and you wish to express an interest in using the iPCRN tools you can register your interest - HERE. Q. What specific services/tools does the iPCRN provide? Q. What anonymised data is sent to the IPCRN when i use the Remote Tools? Details on our remote tools and the type of anonymised data that is sent to IPCRN for analysis can be found HERE. Q. Can a patient be excluded from this research? Yes, Patients may be excluded - opt out - from the uploaded anonymised data file. For more information about how an individual patient may be excluded please contact your software vendor and they will direct you on the next steps. Q. Is there a FAQ guide I can download for patients? Q. Is there a poster I must use in my practice to notify patients that we're involved in research? Q. Is consent needed to upload the data to the iPCRN? All data sent to the IPCRN is anonymised. 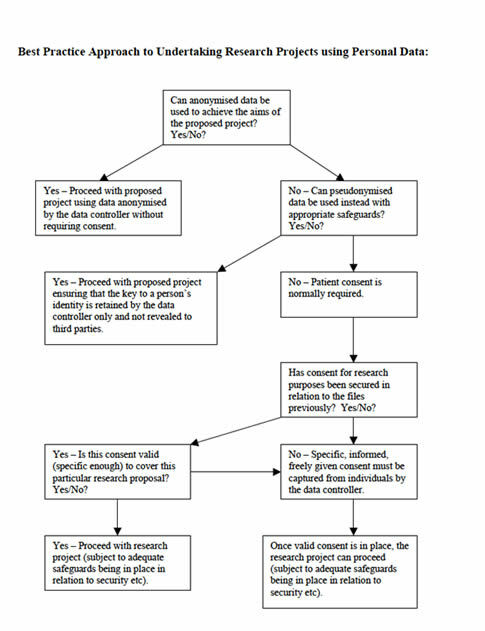 Below is a screenshot from the Data Protection Commissioners document entitled "Data Protection Guidelines on research in the Health Sector"
Anonymised data can achieve the aims of the project. The data is anonymised by the GP Vendor Systems BEFORE it is sent to the iPCRN, so we do not receive any identifiable data. Q. In one of our video tutorials we describe how a patient, new to a GP practice may have been previously prescribed insulin and this will show up thanks to the iPCRN tool. How is this possible? On registration with a new GP, patients give details of their past history including details of chronic conditions, previously treated conditions and medications prescribed. This is then entered onto their medical record and ensures informational continuity of care. This is an example of an internal practice tool – it is used only for the purpose of identifying patients locally on their GP practice computer system run only within the practice system and not outside it. No data is transferred outside of the practice when using these type of local tools. Q. In one of our sample audits the words “past”, “family” and “social” are used. What exactly is described under these headings? GPs record details of past history, family history and social history as they may be risk factors for various clinical conditions and this information contributes to clinical diagnosis and decision making. However, only disease codes (such as ICD10 and ICPC2) are uploaded. This means that no personal identification is possible in relation to these risk factors. GPs sometimes record additional data in free text (for their own records) but all free text is explicitly excluded and NOT uploaded to the iPCRN. We also do not receive identifying information related to the family such as family names. Q. Do we link data received from National and International Collaborators to the data received from GPs? No, we receive data from GPs only and store this data completely separately in a different server to any other projects. This server is used only for the iPCRN and only by the iPCRN. Q. Who will have access long term to this data? There are no plans to increase access beyond those who have access now. GP’s and practices MUST be formally consented before data uploaded to the iPCRN can be used for any purpose other than its initial intended purpose. Q. Who will have access to the research carried out on this data? We will publish our research in conventional, peer review journals. A good example of the model we plan to use include the research from the QResearch group in the UK- please see their website. Q. Who will have access now? Two people currently have access, a data technician and the Director of Operations. Q. Can I remove my data from iPCRN after it has been uploaded? Yes. A formal application may be made to have your practice data removed from the iPCRN. As we cannont identify data by practice name you will need to proivde your unique 32 digit practice ID and a signed application for confirming your wish to have this data permenatly and irreversibly deleted. Q. What Practices are involved in iPCRN research? It is important to stress that we cannot identify data in the database that is specific to a particular practice. Each practice is assigned a randomly generated identifier, which is used rather than the practice name itself. So at present participation in the iPCRN is on a voluntary basis. When the iPCRN is formally established names of participating practices, providing they consent, will be on the iPCRN website. However, as previously stated identification and linkage of data to practices will not be possible. * The iPCRN encourages all members to use our audit/patient finder tools for the purposes of their own audit and research. Our algorithms evolve on a regular basis as we strive to make them more sensitive based on user feedback. For more specific and up to date details on our algorithms please contact us.